Gain the advantages of high-end protection from voltage troubles. Electronic voltage stabilizer for AC – Here’s a completely electronic voltage stabilizer that helps to protect your air conditioners from any harm caused by voltage variations. 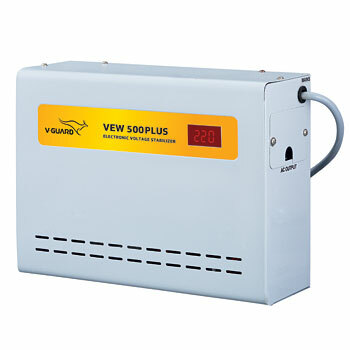 Digital display shows input and output voltage – Adding great convenience, this model comes to you with an advanced digital display that helps to measure the input and output voltage ratios. Low & High Voltage Cut-off Protection – No matter what the voltage condition is, whether high or low, this model is equipped with protection for all conditions. Built In Thermal Overload Protection – At times when temperature rise happens in stabilizer due to overload or due to any damages in connected equipment, the stabilizer output will cut off to protect the equipment. Wall Mounting Cabinet Design – This model is not just about high efficiency, but also great elegance. It comes with an attractive cabinet that perfectly blends with your interiors. What’s more? It is also equipped with a stylish new display and is very easy to install. 3-years warranty – Fit it and you needn’t worry for the next three years.